If you are interested in investing in dividend-paying stocks, then you must understand the dividend payout ratio. 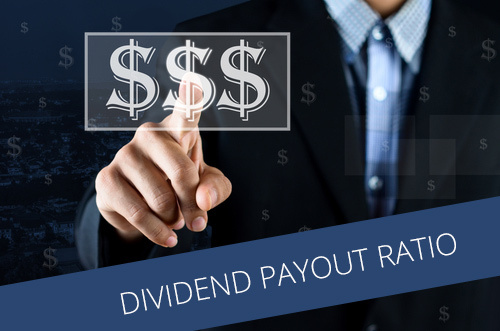 The dividend payout ratio is simply the amount of dividends paid divided by the total net income of a company. Many dividend stock investors use this all-important ratio to determine a dividend’s long-term sustainability. 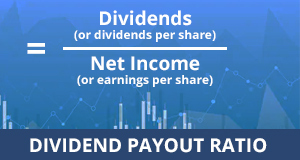 In order to calculate the dividend payout ratio, you will need to know the amount of yearly dividends paid out to the shareholders, also known simply as dividends, and the total yearly net income of the company, also known as net income or earnings per share. You want to divide the dividends by the earnings per share to get the ratio. Investors tend to look at payout ratio over the long term. For instance, if a stock has had a rising payout ratio over the last ten years, that indicates that the company will most likely continue to pay a rising dividend for the next several years… or income is dropping. In fact, a select group of dividend-paying stocks known as the “Dividend Aristocrats” distinguish themselves by raising dividends for at least a quarter-century. Dividend investors seek to find a “sweet spot” when it comes to payout ratio. If the payout ratio is too low, that indicates that the company may have room to raise its dividend. It’s even possible for a dividend to have a payout ratio of 0%. That means the company isn’t paying a dividend or has negative earnings. They might be paying dividends from their bottom line. Many dividend investors see this type of dividend payment structure as unsustainable. Which Companies Likely Have Low Ratios? A low dividend payout ratio signals a company that sows much of its profits back into the business. In this group, you will find many younger, start-up firms. These rely upon the earnings as capital to expand product lines and services, especially those that have proven successful. To meet the demand for these products, the companies seek more equipment, supplies and employees. Manufacturers may expand the size of plants, while growing retailers acquire land or other buildings for stores. Newer companies often need marketing and advertising to expand name and brand recognition. The profits can aid these companies in those efforts. As with other technology, the biotechnology sector relies heavily upon research and development. As such, profits are often devoted to such development efforts to sustain the enterprise. Investors of well established companies often see higher levels of dividends. The longer lived stalwarts and recognized brands have higher dividend payout ratios due to a combination of their products and the expectations of shareholders. Companies with higher dividend payout ratios have developed over the years well recognized products and brands. These include manufacturers of soft drinks, batteries, personal care and household products, foods and other daily consumer staples. Oil and fuel companies also rank among those with the highest dividend payout ratios. More established companies have made annual dividends a seemingly regular occurrence. As such, shareholders may deem skips in dividend payments or significant drops in the ratio as evidence of poor management or trouble for the company. This apprehension might reflect itself in lower share prices, which prices board may seek to prop through higher dividends. The optimal or right ratio depends upon many factors and points of view. As an investor, you likely want the ratio to be as high as possible. You will likely have more dividend income. What may be right for the company maybe less. At this ratio, the company is generally paying up to half of its profits in dividends, while investing the other half in growth, expansion and maintenance of the business. Companies who pay out this ratio usually signal stability. If you’re an investor and especially a startup or high tech firm, don’t think that ratios south of 35 percent are bad. In fact, companies with these small or zero ratios emphasize research, testing and development for products. The value to an investor is realized through the growth in the value of the business rather than through dividends. Similarly, do not assume that high payout ratios indicate a valuable investment. When payouts rise above 55 percent, it may indicate for certain companies short-term appeasement of shareholders. With higher dividend payout ratios come less money retained for maintaining the business. Manufacturing and other businesses with considerable amount of physical capital need funds for maintenance and upgrades. Excessive use of dividends reduce the availability of earnings for capital improvements and other business expansion. Thus, to grow the business, the company must borrow or garner more stockholders. Should the company opt for the former approach, the increased debt will also carry more interest expense and cut into profits — and the capacity for future dividends. Remember that bondholders and other creditors have a legal entitlement to be paid, whereas dividends generally are discretionary. Creditors thus have priority over shareholders when it is time for payments. Pay special attention to dividend payout ratios that approach or even surpass 100 percent. Companies paying dividends at this rate likely will dip into cash reserves, borrow or sell certain assets to find the cash. Increasing debt for the sake of dividends further threatens the profitability of the business. The company’s dividend practices — as reflected in the dividend payout ratio — may have tax implications. Federal tax law treats some dividends as ordinary income, along with wages or payments for services. Ordinary income carries a tax rate of ten percent to a maximum of 37 percent, depending on your total taxable income. By contrast, long term capital gains have a lower tax rate. If you hold your shares for longer than a year, the gain enjoys a lower capital gains rate. Shareholders pay either no tax, 15 percent or 20 percent tax on these gains, again dependent upon income. Among the criteria for qualified dividends is the shareholder’s holding period. To satisfy the holding period requirement, you must hold the stock for at least 60 days of a 121-day period which starts 60 days before the “ex-dividend” day. This means you must own stock before this date to receive dividends declared for that year. In this scenario, for your dividends to be “qualified” for lower tax rates, you must hold the stock for 60 days between May 11 and September 9. The dividend payout ratio should be just one of the factors in your investing decision. Using it as your primary criteria could lead you into poor investment outcomes. This ratio indicates the company’s performance in controlling the costs of materials or other items that generate the revenues. A high ratio means that the business has efficient manufacturing or service delivery processes and controls the cost of inventory, supplies and employees involved in production or rendering of the services. A low ratio indicates that the company has problems with administrative overhead. It might portend of too many positions in management or too much spent on matters that, at best, are tangentially related to earning revenues. Also, excessive debt or poor tax planning by the company may factor into a low net profit ratio. Sales come not only from cash, but from credit. On a balance sheet, the credit sales are reflected in accounts receivables. This figure represents what the company is owed. A lower number relative to the total sales means that the company is adequately collecting its debts or receiving cash for its sales. The cash flow margin uses net sales to account for discounts and returns. The dividend payout ratio affords valuable insights into a company’s strategy and financial condition. However, expand your research of a company’s finances and performance with other ratios and examination of financial statements such as the balance sheet and the income statement.